I really feel that you don’t have to go overboard decorating for the holidays. 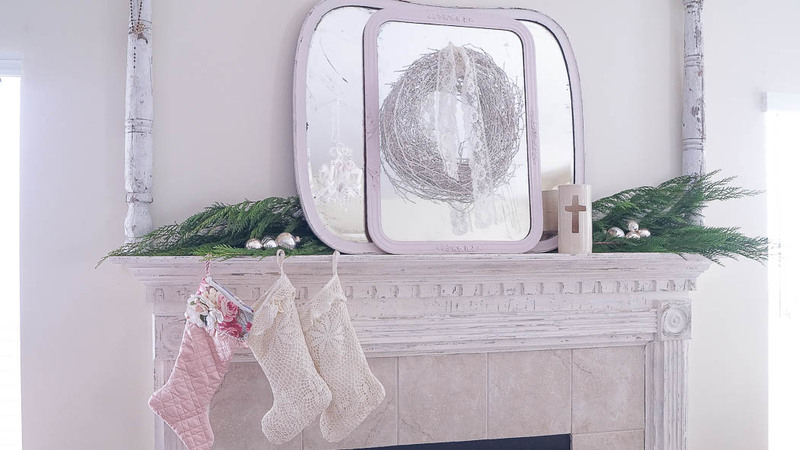 Let me show you how to decorate a mantel for Christmas, and keep it simple. First let me show you what I did with mine, then at the end of this post, I’ll give you some tips. I’m slowly becoming a minimalist, although I still have a long way to go. My mantel depth is quite small, so I really can’t over do it anyway. This year I decided not to change much on my mantel. I still really love the look of my layered mirrors, so I just added a few things to decorate it for Christmas. Since this is a working fireplace, I don’t like too much hanging from it either. That gate in front of my fireplace is very heavy, but I love how it adds a vintage touch when it’s not on. I don’t always hang our stockings from the fireplace, but this year I did. I often have people ask me, how can you tell who’s stocking each one is. Well the pink one is my daughters, the other two are for me and my husband. Many years ago, a friend made that sweet pink one for me, using scraps of vintage material. The other two lace stockings were found at a thrift store, and those are really just for looks. My husband and I don’t exchange Christmas gifts, we haven’t for many, many years. Which is fine with me, if I see something during the year, I get it, and the same goes for my husband. My Christmas gift this year is my new table. So back to the mantel. I added a few sprigs of fresh greens to each side of my mirror. These usually stay pretty nice even when they start to dry out. For a little bling, I’ve added a few silver ornaments. I love that candle votive, that was a gift to my self last Christmas from Rachel Ashwell’s store Shabby Chic Couture. 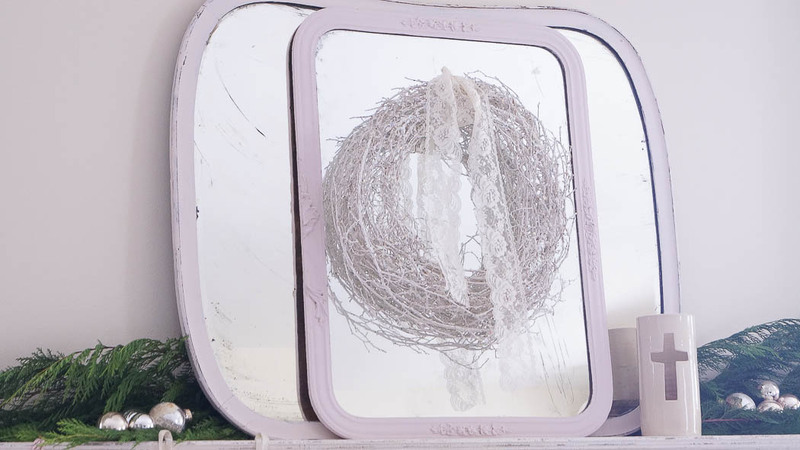 On my mirror, using a suction cup hook, I hung a white painted twig wreath I found at a thrift store last year. I added a piece of lace for a little romance. I love simple vignettes like this. My mantel is all ready for Christmas but it’s not over done. I have nothing against decor that is over the top, I think it’s quite beautiful. I find comfort surrounding myself with only the pieces that I truly love. 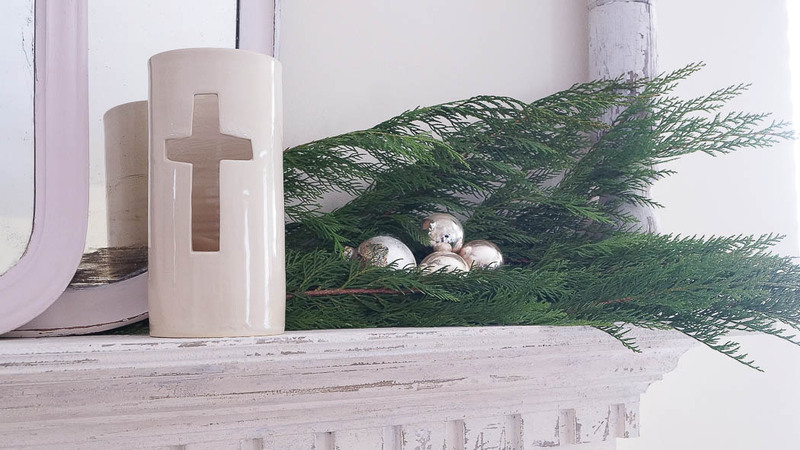 Here are some tips for on how to decorate a mantel for Christmas, and keep it simple. Start with the center. Think about what you would like to have on the center of your mantel. You can hang a wreath, use an architectural piece such as a small gate (but make sure it’s secure). Once you decide what you would like to use as your focal point of your mantel, you can add the rest of your decor. This year I decided to keep my mirrors and add that wreath onto my mirror. Add balance. On each side I placed fresh greens. Since we use our fireplace, I didn’t want anything hanging too low. You can use fresh greens, or faux greens. You can even use branches or twigs tucked inside pitchers, on each side of your mantel. To make your branches more festive, spray paint them, white, gold or silver. And add a little bling with spray on glitter. Hanging stockings. You can hang your stockings from your mantel. But remember if this is a working fireplace, don’t hang them over the opening of the fireplace. Adding garland can be the perfect touch. And I do think that looks very pretty. 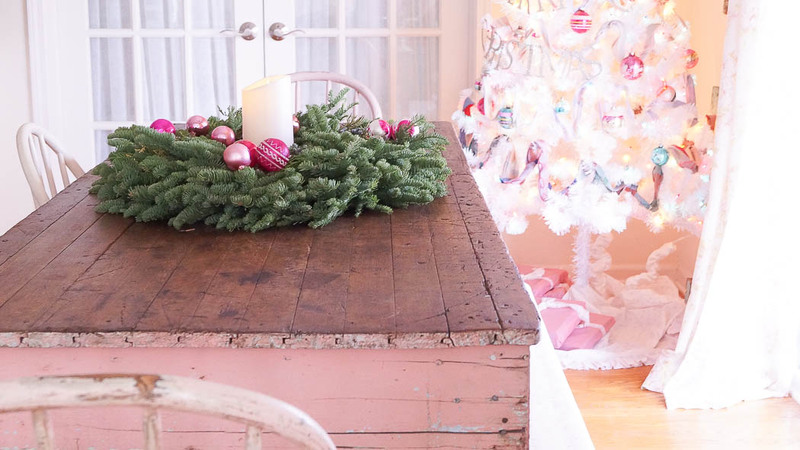 You can use faux or real garland. But again, if this is a working fireplace use caution with real or faux. How ever you decide to decorate your mantel, create something that makes you happy. I have lots more to share as I am joining several tours this week. 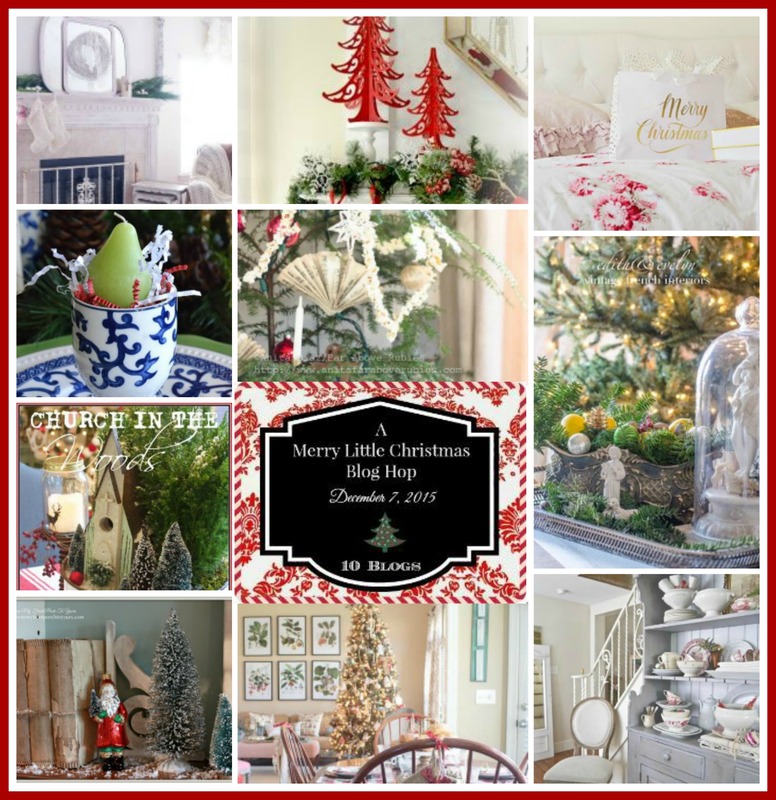 Make sure you hop on over to all these other beautiful blogs. I know that you will be inspired! Anne, your home is beautiful! Love all your tips! So pretty Anne and that table! 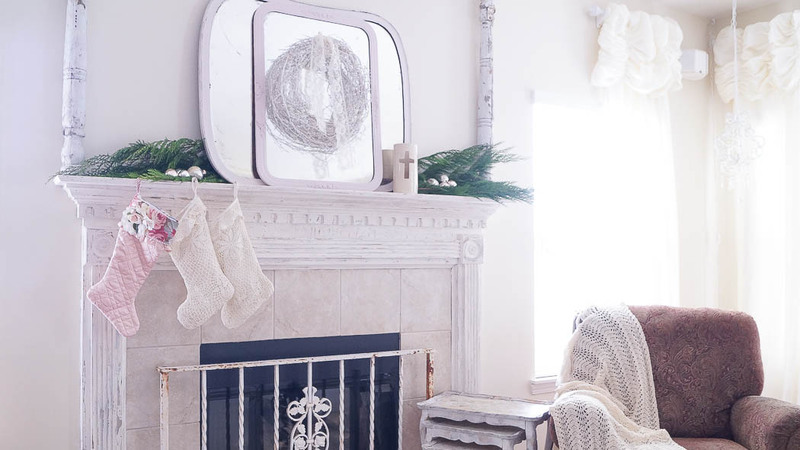 A beautifully simply beautiful mantel Anne….and I am with Janet..love that table! Such a beautiful mantel, Anne … I always love seeing fresh garland tucked “here and there.” Your added shiny silver balls look so pretty nestled against your garland, too! 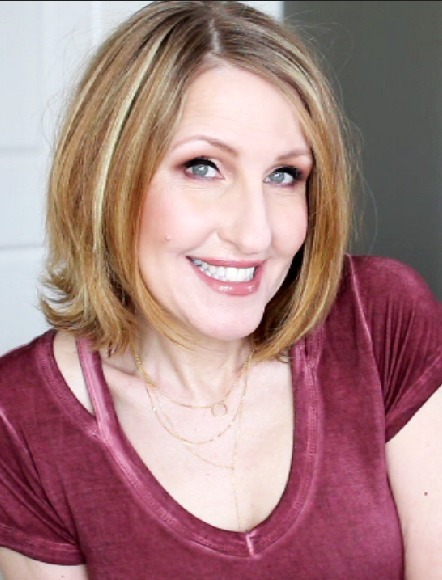 I love the tips you’ve shared and am happy to be blog hopping with you … Happy Holidays! Beautiful Anne! Your home is lovely! TFS your tips too! I love your mantel Anne.. The pure simplicity of its decoration speaks volumes about beauty. I have never been one for over the top Christmas decorating either. I admire it in others’ homes, but it is just not “me” and it just doesn’t work in my home. I ‘m sad to say that I really don’t do much to my mantel for Christmas. It’s different every year and always the last thing I do. Last year, I had some tiny white lights secured across the back of the mantel and set my nativity scene in the center of the mantel with some large silver candlesticks and white candles at one end. I thought it looked like an afterthought. With your tips, I think I can put something together this year that is more reflective of my and my husband’s personality. Thanks for sharing!! Anne your mantel is so pretty but I have to admit I am totally crushing on your new table girl!! It is to die for. I can not wait to see more of it.